The life of a structure depends upon its stability and that is what is affected by the ingress of water; this is where waterproofing companies come in. With the upsurge in construction projects in African countries including South Africa, it is very important to know the top waterproofing companies that can meet your waterproofing needs. Here is a list of the top waterproofing companies in South Africa with a wealth of experience and expertise in deploying major waterproofing products and services. National Urethane Industries was formed in May 1982. They have been the pioneering company within Africa supplying a basketful of waterproofing products mainly Polyurethane, Pure Polyurea, Hybrid Polyurea, Acrylic and bitumous membranes. Their products are made from the best materials available for these chemistries and are monitored under the ISO 9001:2015 quality management system. NUI employs qualified coating inspectors who have been trained by NACE and have the full support of the company’s well-equipped laboratory. In recent past NUI has undertaken a couple of projects in Africa which include Melrose Arch South Africa, Standard Bank Head Office, China City Bank, Department of Water & Sanitation, and Eskom Power Stations among others. NUI CEO, Mr. Donovan Slade comments that each and every technology has its application and position within the market. “There is no waterproofing system that is suitable for all applications or environments, it is therefore important to a waterproofing product customer to choose a company that has the credentials and experience to back their claims. 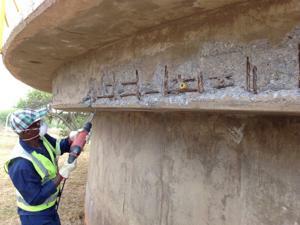 Ensure that the supplier is a member of an association such as The Waterproofing association Of Gauteng,” he said. Derbit is a company born in 1932. Since its birth, Derbit has always been of paramount importance to the construction industry. This is clearly represented in its strategy: to develop innovative products and services for the sustainable construction and renovation sector. Some of their products include: Bituminous waterproofing which has double reinforcement. Classic flat roofs which has High resistance to mechanical charges and UV-rays. Their Reflective roofs are Less warming up which equals to less ageing, have Extra yield for PV installation and are capable of Recycling rainwater. The company’s Roof terraces and balconies have a waterproof extra space with carrying load, Reliable solution and Possibility of flame less application. Their Parking roofs, Bridges and roads have Outstanding resistance to heavy traffic and grit, Suited for irregular decks, Efficient application with special equipment and low and competitive processing costs. All this products have proven life span of over 45 years, they require minimum maintenance and they are 100% recyclable. Waterproofing is an old technology but Derbit has been in the front line innovating and modifying the technology to meet the current market needs. Derbits products and services are used in and outside Africa. Technical & Marketing Manager of Derbit SA (PTY) Ltd advice waterproofing customers to Stick to world renowned products that are a good value for money. “Consider the specification and uniqueness of the product e.g. lifespan, technology, etc. and ensure that your supplier is credible,” said Mr. Harland Dix-Peek. Active Holdings and Jointing are professionals who offer services on waterproofing including; Design and installation, jointing during construction and upgrading buildings, waterproofing of new and existing buildings, grouting of support systems and repairs concrete during construction or movement and age related cracking among other services. The company has being a big implementer of new technologies in waterproofing, a reason that drove it to introduce one of their own “polyurethane tile waterproofing” three years ago. Active holdings and jointing have engaged in projects such as the Houston hotel and apartments project which had one of the largest ever waterproofing service need in South Africa. Sidney Coetzee the company’s overall manager says that it is very important for a waterproofing customer to let an individual company undertake the entire process from design to installation. Based in Johannesburg, South Africa’s capital, Bitumproof SA waterproofing offers comprehensive waterproofing systems to commercial, industrial and residential buildings in South Africa and Surrounding. With years of experience & a formidable knowledge of waterproofing solutions, the company offers professional consultations & free quotations on all residential, commercial and industrial properties. Their waterproofing products have unique aspects in that, they are UV resistance, an aspect that enables them to live a guaranteed 10 year maintenance free. Their spray application system covers up to 1000 square meters a single day. All their products are Eco friendly therefore non-toxic and environmentally safe. There are no cases of overlaps with their products due to their seamless coverage aspect. Bitumproof SA products require no heat because they are entirely cold applied. Due to their product strength and flexibility, they are good enough to withhold any joint movements. Their Great adhesive properties binds well on all roof surfaces i.e. tiled roof, IBR roof, metal roof and concrete roofs and also on glass and wood. In regards to technologies, Bitumproof SA only uses the most advanced technologies in waterproofing, their products and materials are unsurpassed in the industry. Steve Bravo, BitumProof SA Sales & Marketing Manager, recommends to customers seeking to buy waterproofing products, to go with a maintenance free solution which will not require any servicing. “This plan will ensure that no further maintenance costs and money spent will be incurred by the client on the waterproofing work performed, giving them complete peace of mind,” he added. Alchimica building chemicals has been providing solutions to waterproofing problems for over 30 years with its extensive range of polyurethane liquid membranes which are the most versatile and long term performing of the liquid applied membrane waterproofing category of products. The systems are applicable to new builds as well as renovation projects. Alchimica products have been applied successfully to numerous applications such as: Flat Roof waterproofing. Wet Rooms/Balconies/Bathrooms. Water/sewage treatment plants. Stadium stands or Car Parks. Bridge decks under asphalt. Foundation walls and retaining walls. Alchimica has executed a lot of projects since they began operating. Lately they have completed a 25 000 square meters fully exposed car park in Maputo, last year, as well as various other projects. 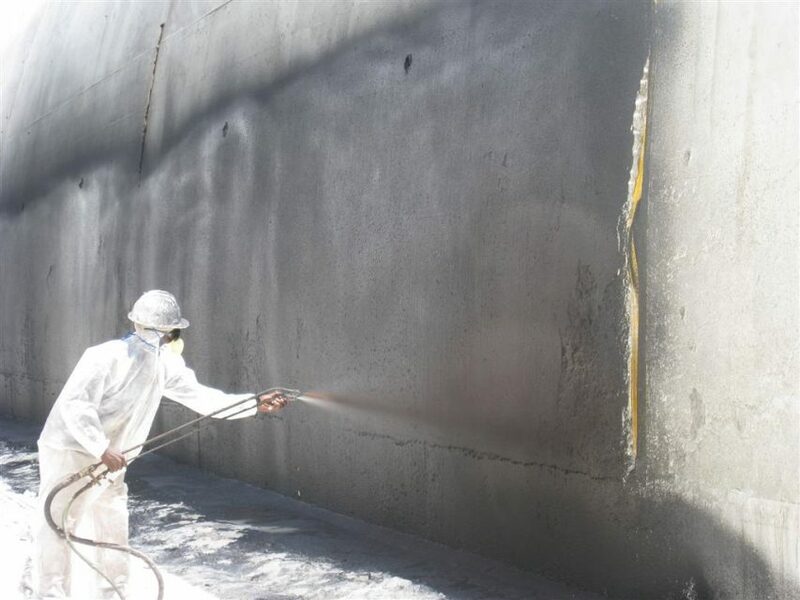 Alchimicas’ HYPERDESMO®-HAA is a unique single component polyurethane liquid membrane, based on the successful combination of Hyperdesmo and Accelerator 3000 which throughout the years has provided applicators with a solution for a fast curing, bubble free thick layer membrane. The company’s commitment to R&D and investment plus their efforts to continuously upgrade their Chemical processing plant has allowed them to formulate a Hyperdesmo® with the Accelerator 3000 incorporated in a blocked fashion, that upon contact with humidity is released and self- accelerates the curing of the material in a similar manner as the Accelerator 3000. Lola Verlaque of Alchimica building chemicals, tells waterproofing customers to curb the tendency of choosing the cheapest products and instead go for a long term solution that may cost a few dollars more initially but have no maintenance costs down the line like the Hyperdesmo system which is a 10 year maintenance free guarantee. Established in 2000 Advanced Waterproofing has over 20 years of experience in the Waterproofing Industry as a whole. On an average month the company installs over 20,000 square meters of various approved products and their portfolio consists of contracts carried out for Domestic, Industrial and Commercial clients. Some of their service and products consist of; Waterproofing of concrete roofs, insulated boarded roofs, lightweight screed roofs, IBR and corrugated roofs, as well as tiled roofs. The company also specializes in the waterproofing of retaining walls, parapet walls, cellars / basements, water features and balconies, in addition to polyurethane waterproofing and sealing of face-bricks externally. Advanced Waterproofing also applies anti-corrosive coatings to roofs or any area necessary. Advanced Waterproofing are Approved Plascon and Prominent Paint applicators. Insulated roof systems: This system is used to create cool and warm temperatures for both domestic and commercial buildings. All their products are green and thus eco-friendly and good to the environment, advanced waterproofing products are also quick to drying which takes at most 20 minutes after installation and they are also very light, nevertheless, they also have a long lifespan compared to ordinary products and they do not require maintenance on the long run hence gives the client a settled state of mind. Some of the projects undertaken by Advanced Waterproofing include; Helen Joseph Hospital, The Glen Shopping Centre – Car Park Deck, Sandton City Shopping Centre among many others. “I would advise a waterproofing customer to consider purchasing products that will not give them a headache after installation due to maintenance demands.” Said James Gowans, the owner of Advanced Waterproofing. A to Z Waterproofing is a Johannesburg based company that works across South Africa, specialising in waterproofing and painting. They are proudly engaged in restoration and rejuvenation and use of lining and sealants. They also work hand on hand with Dulux Paints SA to ensure the highest standard of workmanship is delivered to their clients. A to Z Waterproofing’s product is unique in that, first and foremost, it is a polymer based product.This means that it is applicable by use of a paint roller and it also works in conjunction with a fibre bandage. Once the two products are combined they become a flexible rubberized mat that can bend to any shape or size. These products can bind to steel, concrete, wood, plaster, clay roof tiles and slate tiles. The application consists of five layers an aspect that enables it to hold large volumes of water. Basically this product was designed to build dams. Nevertheless, A to Z Waterproofing product is flexible and this allows it to contract and expand when necessary and it is cement based, this gives room for direct-tiling and painting. The company, due to their great knowledge and expertise, they have been a part of various projects one being the Eckland Safaris in Limpopo. In addition the company has also done projects for Sun International (Carnival City and Sun City). Not to mention Zambezi House, a nine story building opposite the Carlton Centre in Johannesburg. Their product is crystal based. This technology makes the product applicable to any cement based area that has water seeping through it. Once applied, the product can travel up to one meter through concrete and can seal both sides of the wall. What makes this product unique is that once applied, water is applied for a further four days therefore creating the crystals to travel the cement. Once the application of water is complete the crystals start expanding and this enhances the sealing procedure. “In addition, be certain that they are dealing with a reputable company that offers a good warranty. The company should meet the client on site to do a walk through, see the problem and give their advice to the client. A formal quotation is essential which binds the contractor and the client to a formal agreement,” he concluded. Established in 2009 at South Africa, NuSeal Waterproofing and Specialist Paint, is the developer, manufacturer, applicator and supplier of NuSeal Products all around the world. NuSeal is the only non-cementatious product of its kind with a 33 tons/m2 adhesion strength which is incomparable to anything else on the market. The product is a simple 1 step spray on water-based solution that will not only seal the area required, but can reduce the temperature by up to 25C(sink). The company has recently completed a project for the King of Saudi Arabia and the Rossano Garcia Power Station in Mozambique. The entire product range is new technology. It is Eco-friendly, of low maintenance, easy repairable, UV resistant and quick to apply. NuSeal products are also safe to use. Ri-Jean Smallbone, Director at NuSeal Waterproofing and Specialist Paint said that Customers should try new products for example, the NuSeal, instead of only targeting the old ones that keep on disappointing them over and over again. Just because it has been around for years, doesn’t mean it is the best. “Time and time again we have architects and Engineers asking us why our product is better than others on the market. It is simple, we have done research and developed something to solve a problem that will last for years and can withstand the harsh environment it gets put through,” she added. Since 2006, Atlas Roofing has been a supplier, manufacturer and installer of a unique roofing and waterproofing system known as the Structural Insulated Panel(SIPs). The system is a sandwich panel consisting of 11mm oriented strand board (OSB), 80mm Polyurethane foam insulation, 9mm Magnesium oxide ceiling board and variants. Their projects are waterproofed mainly torch-on waterproofing and sometimes alternatively waterproofing system. The company has worked closely with the University of Pretoria and recently finished work in 2018 at the roof of the Future Africa Conference Centre in Pretoria and has also done work at the SASOL South Africa Head Quarters in Johannesburg. SIPs technology in roofing is a new concept in Africa and still in its infancy. This technology has been in use in USA and Europe since World War 2. Sanika Waterproofing Specialists has been firmly entrenched in the specialist waterproofing, industrial coating and roofing industry since 1987.The Company offers a full range of waterproofing solutions, from their own specialized waterproofing systems to traditional and conventional systems.They are best known for their Kryton Crystalline Waterproofing solutions, Emseal expansion jointing solutions and insulative boarded system. Sanika are implementers of new technology in waterproofing industry. They designed and developed an Insulative Boarded Waterproofing System that boasts a 10 year maintenance-free guarantee. This roof cladding system eliminates any water penetration and external thermal radiation by application of a unique laminated insulation panel, profiled to the sheet design and topped with a maintenance-free torch on membrane which renders the roof area totally waterproof as well as insulated against heat, sound and dust. Baseline waterproofing are specialists who provide different waterproofing solutions for different areas that are essential to prevent further deterioration in building structures. Some of the areas that baseline waterproofing specialists undertake work on include; Roofs- Concrete, IBR, corrugated, klip lock and tiled. Retaining walls, parapet walls and boundary walls.Balconies, showers and steam rooms.Wine cellars, cinemas and basements.Planters, sumps, water features koi ponds and dams. The unique aspects of Baseline waterproofing products and services is that they use only quality material and fully support local and overseas waterproofing products. For example their torch on waterproofing is imported from Italy.This product is a high grade bituminous membrane and has stood the test of time. Baseline waterproofing provide a thorough approach and offer their customers detailed quotations/scope of work and assessments in order for them to know exactly what they are paying for and what they are getting. ”I would recommend to a potential customer that before going ahead with a waterproofing applicator, make sure you are comparing “apples” with “apples” regarding the products that will be used.” says Maxine, adding that the customer should find out about the waterproofing products the contractor is using as there are thousands out there all proclaiming to be the best. “Find out what warranty is issued with the product. Ensure that you get references before accepting a quotation. There are associations in the building industry that have certified members and when you are in need of a waterproofing contractor or any contractor for that matter, it is best to get a recommended and reliable company to carry out the work.” she concludes.